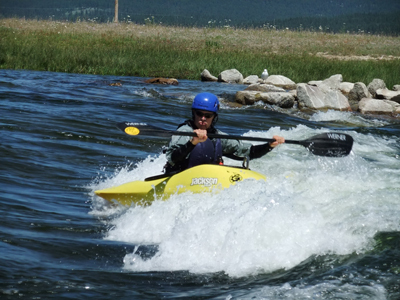 This spring we had the opening of a new whitewater park up on the North Fork of the Payette River called Kelly’s Whitewater Park. Built with the support of Cascade philanthropist Hans Bornobus, Kelly’s is named after Kelly Brennan. Featuring 5 playspots, a welcome center, and a whole bunch of other cool stuff we here at payetteriver.org decided we should solicit some reviews from some not-so-local but here all summer paddlers. Our first victim in a series of reviews is Kim Johnson. She is a great paddler from San Diego who graciously sent us pics and the following review. Where are you from: San Diego and Colorado. How Long have you been paddlin: off and on before Tren was born. What was your first impression of the park? I was pretty impressed, I got there on the day the Jackson’s were there for one of the Opening Compeititons, …the parking lot was packed, the log gates over the entrance were grand, and I was slack-jawed by the visitor’s center and the landscaping. Did any of the features seem big/small/trashy? The top feature seemed a bit sticky when I first looked at it, though when I got in it it was friendly and fun. It seems like it has some places that are more retentive than others and it will get your attention, but I liked it. the smaller wave on river left is perfect for learning to spin and front surf. If you flip the wave is deep and the water is nice and warm. All of the park has great eddy service and lots of room so you are not slamming into 10 of your best friends in the eddy. There is also a very small, very friendly wave just underneath the Welcome Center that is perfect for working on skills and really great for people who are new to playboating. Someopne should nickname it the Girlfriend Wave….as in perfect for teaching your girlfriend how to surf and spin. Or boyfriend. How crowded was the park? I have never been there more more than a handful of people. How was access to the features and ammenities? Easy and nice. Lots of parking, lots of space to unload your stuff, and dry your gear. Best of all, everything (including really nice bathrooms) is FREE! What was your favorite part of the park? A really pretty place with easy access to some great and varied park n play. Plus it seems that it will have great park n play later in the season when lots of other park n play is done or filled with townies on boogey boards. What was your least favorite part of the park? The get out, but that will be remedied when they install the bridge to the middle island. Wish they would have installed some slalom gates, but one can’t have everything. The reviewer doing her best motorboat impression while spinning in the hole. For more info checkout the Kelly’s Whitewater Park website that includes a pretty cool webcam! We love feedback! Please login and post comments, reviews, ect!